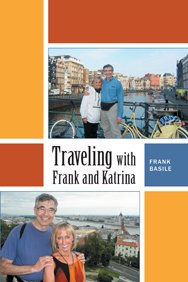 Frank and Katrina Basile rarely take the road most traveled. While traveling to 174 countries on all seven continents from Bhutan to Bosnia, Antarctica to Greenland and Serbia to Syria, they’ve experienced the world in ways you won’t find in guide books. So come along with the Indianapolis Business Journal travel columnist and his wife on their journeys throughout the world. This book will entertain you, motivate you to travel, provide you with some travel planning ideas and stimulate your thinking about possible travel destinations.